For two rampant minutes, Australia looked like they were en route to a confidence-building 2-0 series win as Kurtley Beale lit up the Melbourne night with a superb early try. After a difficult time since the World Cup, Michael Cheika's men were looking to launch their season in this series and, having gotten off to a winning start in the first Test they believed they could close things out in the second. Instead, they were blown away by the relentless Irish power play that has been the hallmark of Ireland's season. Like so many coaches before him, Cheika conceded that nothing Joe Schmidt's side did surprised him, but his team were powerless to stop it. After stewing on their first loss in more than a year, the tourists improved their aggression and accuracy, holding on to the ball through long sets of play and they frustrated the locals. Ireland will regret the fact that they didn't make life more comfortable for themselves by making their pressure pay on the scoreboard, but they'll also wonder how the Wallabies kept a full complement of players on the pitch despite repeated infringements under pressure. Referee Paul Williams penalised the hosts 15 times, but only showed one yellow card to the men in gold for Marika Koroibete's tip-tackle on Rob Kearney. Despite conceding three fewer penalties, Ireland lost Cian Healy and Jack McGrath to the sin-bin at the end of each half and the second yellow almost cost them the game. It would have been a scarcely deserved win for the Australians and Cheika admitted his team had been second best. He will be focusing on lowering that penalty count over the course of the week in Sydney. "I didn't think they played much different to how they played last week," he said. "They had a lot of ball, they tried to go down the middle and I think we just defended a little stronger in the middle last week. "They were playing a lot of that latch player where you've got to get down low and tackle a bit lower. "They had a lot of possession, we defended well on the line and our work ethic was good, but I thought we were slow to some attacking ruck situations when they got penalties and also I thought that in general there was too many soft penalties that piggybacked them into position or into points. "You saw that (we lost by) five points and we scored one try more, all converted, it sort of says it all doesn't it?" Australia will have to cope without experienced scrum-half Will Genia, who underwent surgery on a broken arm yesterday. 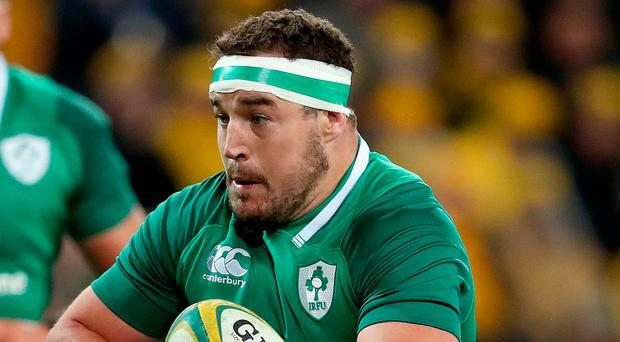 Cheika was unhappy with the incident involving Cian Healy that led to the defeat, but he said the Wallabies would not pursue action against the Ireland prop. "I'd rather look at ourselves. No excuses, mate," he said. Ireland bounced back from the early concession to take complete control, with Andrew Conway scoring a try and Johnny Sexton kicking his side into a commanding position as he punished the home side's discipline. After the double-punishment of a penalty try and Healy's yellow card for pulling down a maul, the men in green needed a second try to give themselves a cushion and, after near misses for Keith Earls and McGrath, Man of the Match Tadhg Furlong powered over Nick Phipps for the all-important score. As a high-paced 80 minutes took their toll, Ireland finished a man down and with a makeshift team and they creaked under pressure as Taniela Tupou scored. At the end of a dominant performance they found themselves needing a big defensive set at the finish in scenes reminiscent of their 2016 win over the same opposition and when Israel Folau knocked on they could celebrate their deserved victory.Both teams will retire to the drawing-board to come up with something different for the finale in Sydney on Saturday. Referee: P Williams (New Zealand).